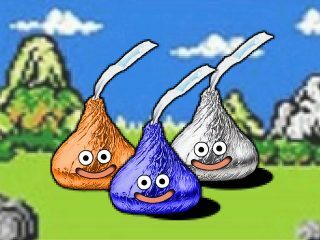 First up, “Some Kisses Draw Near,” a play on the Dragon Warrior/Dragon Quest series of “slimes” replaces as Hershey Kisses. The thing here is, it’s such an obvious change, once you see it, but it wasn’t ever something I had considered. Yes, the slimes do bear a resemblance to the candy, but until you actually see this piece by Octoyaki, it’s not necessarily a crossover that you would have ever considered… Now, however, I’m not sure I’ll be able to play those games again, without seeing this. But, as the candies do, this piece brings a smile to the face, and that’s sometimes as simple as it needs to be. The pixelated candies on a retro game background just gives the switch of slimes to kisses that much more punch. But now that I’m hungry let’s move on. The Fifth Element is one of my favorite films. It just is. And the idea of Leelo and Korben Dallas having a meal together with the flying restaurant and bar makes complete sense. It is done by Jaime Gervais in a photorealistic style that makes it seem like just an extension of the film. 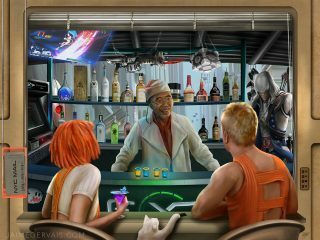 The displays of free spiritedness of the elements (Leelo’s drink, Korben’s cat, the huge smile on the proprietor’s face) leaves me to believe that this takes place after the world has been saved and not before. Though it wouldn’t be completely out of character for the reluctant Korben to want a drink before going off to save the world. So, it must be left up to the observer to decide when this takes place. 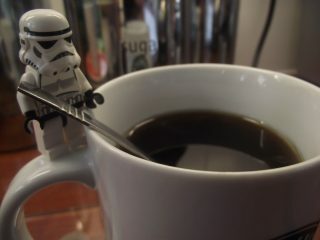 Speaking of drinks, I do love a good cup of coffee, and apparently so do stormtroopers. Although, you can’t be sure if this stormtrooper is making this cup for himself, or for Lord Vader, it is a brilliant representation by Jennatrixx of someone staring into the dark abyss of a black cup of coffee, that will enable one to feel the Dark Side flow through you, or even find some droids. Whatever it is that they day has in store for you, this is definitely the best way to start it. How could you not want to see Deadpool himself, Wade Wilson, don the Iron Man armor and fly around being, well, Deadpool? Obviously, this isn’t something that would actually happen outside of a fan film, but one can dream. 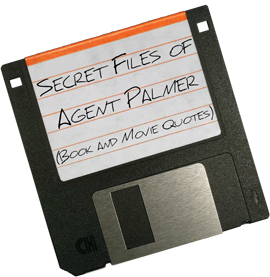 I mean, the whole thing would be great one-liners, and of course if it could be Ryan Reynolds, all the better. But as one-liners go, Deadpool and Iron Man are two of the larger than life characters that can pull them off. Not to slight Ant-Man, but Wilson and Stark are two of the best mouths in all of the cinematic superhero movies. 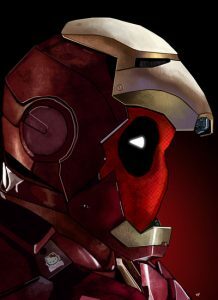 Be honest with yourself, you’d really enjoy seeing the Iron Man mask come up to see Deadpool underneath, just like in the piece, wouldn’t you? I mean, I would. 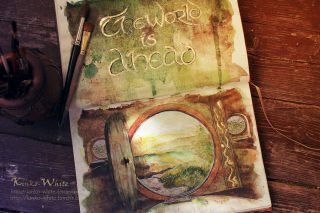 Now let’s move from the cinematic superheroes to unwitting heroes in Tolkien’s world of Middle Earth. “The world is ahead,” is a brilliant visual. It’s beautiful, it has a wonderful theme, and it has the essence of the books captured in just one image. And why is this image so impactful? Because’ it’s looking out through the front door of Bag End, the place where both journeys, The Hobbit and The Lord of the Rings, begin.